This post’s working title was “More Weird Places I’ve Breastfed My Children”. Sigh. This afternoon I trekked to Mott with my three little boys, leaving Richard to enjoy some science classes at LCC and MSU. Next time I’ll trade places with him. Thanks to our wonderful friend Brynn, Parker and Max got to spend a couple hours at the Ann Arbor Hands On Museum (thanks Brynn!) while I took Colten to his appointments. Today he had his follow-ups with the pediatric urologist, Dr. Wan. His first appointment was a renal ultrasound. When Colten was born, one of the diagnoses we received in addition to the Spina Bifida Myelomeningocele, was bilateral kidney reflex. My understanding of this is that urine backs up from the bladder through the ureters and back to the kidneys. The grade (severity level) of his reflux was on the lower end and the doctors hoped he would simply outgrow it. Otherwise, surgery would be needed to correct the issue. Hence the renal ultrasound today. Onto our second appointment, the cystometrogram. This procedure requires catheterization. Once catheterized, they fill the bladder and then measure how it empties. It is common for some people with myelo to not empty their bladders all the way. This creates a host of issues so catheterizing is often needed multiple times a day for life. I’ll skip the description of watching the first staffer attempt twice to cath Colten. Unsuccessfully. REALLY?! Meanwhile, Colten is not a happy camper. He started fussing as soon as I laid him down on the table again and not surprisingly, screamed throughout the attempts at cathing him. She finally went to get Dr. Wan so he could cath Colten. After that was done, she informed me that if Colten couldn’t calm down, she wouldn’t be able to do the test. In order to get the readings, Colten would need to be lying down and not agitated. Here we go again. He is screaming, crying and inconsolable. At this point, I am fighting back tears because I’ve watched these people shove a tube up my son’s private parts, had to hear him scream throughout this all, watch tears come out of his eyes, and I could do nothing to help. As he is laying on the exam bed, I’m trying to calm him but cannot use any of my normal ways at this point… Colten really isn’t a fussy baby and is usually easily calmed by nursing or just being picked up and held or worn in a wrap/carrier. But he has had 2 of these all-out screaming episodes before and we just have had to ride them out, holding him and getting him to sleep. However, Colten is naked and with his bowels, he is almost constantly stooling. So by now, with all the crying he’s done, the blue pad he is laying on is a mess with poop. So I can’t quite get him picked up. Finally the staff member (still have no idea if this woman was a nurse practictioner, doctor, aide or what) asked me to try sitting on a chair by the test equipment and trying to nurse him to calm him down. She put a blue pad on my lap and I cradled him in my arms and tried to nurse him. So another weird nursing experience in the books. Anyhow, it didn’t work and she couldn’t do the test. Catheterized for no reason. Poor boy. We have a repeat of this test scheduled for May. For now, we have to monitor for enough wet diapers and watch for UTIs. So we got some good news in that the reflux is resolved. No bad news yet in regards to having to cath. And I added two new weird nursing experiences to my list. Oh, you haven’t seen my list? Well, I’ll spare you all the details. Let’s just say my experiences with Colten include nursing while standing and leaning over the side of his NICU bed, nursing during one of his physical therapy stretch sessions, and nursing during part of one of his Anat Baniel Method appointments. Ah, the quirks of breastfeeding! Here’s Colten soothing himself in the car as we get ready to head home… We’re hoping the finger up the nose while sucking on other fingers won’t be a habit. 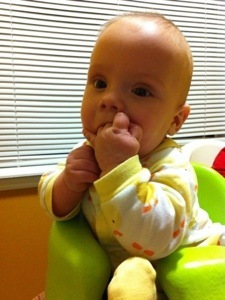 But he sure does love his fingers! This entry was tagged breastfeeding, myelomeningocele, ultrasound, urology. Bookmark the permalink. 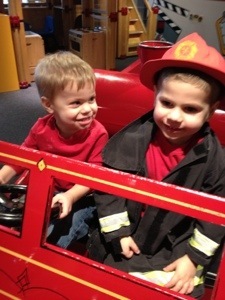 What wonderful friends – those who took Parker and Max on the field trip. Friends like that are PRICELESS.